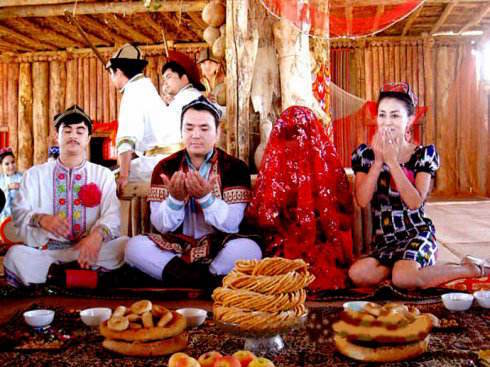 Although Uyghur men were polygamists in the past, nowadays they are firmly monogamous and must follow a strict ritual before winning over the woman of their dreams! Courtship begins with what is known as a marriage interview, which is a necessary step if a young man wishes to marry a woman or if the family wants to arrange a marriage for their son. Before the interview, the prospective groom must learn everything about his lady love’s background, including her age, appearance, personality, and family history. If you thought first dates were hard, imagine having a full-blown interview first! Only once he feels that he is ready will he propose the idea of marriage, although the man and woman may have previously been courting one another long before the marriage interview. In this instance, they would first agree to marry each other and then ask the woman’s family members to conduct the marriage interview, so as to publicise their relationship and make it legitimate. Once the intention to marry has been announced, the groom’s family will hire a go-between to make the marriage arrangements. This go-between will first visit the woman’s family with a number of gifts. If the family accepts the gifts, this is a sure sign that they will allow the marriage to take place. If the gifts are rejected, then the suitor’s success is doubtful. It is after the gift-giving stage that the nerve-wracking marriage interview must take place. The prospective groom will visit the woman’s family and be asked a series of questions about his plans for their future, such as where they will live and how often they will visit. If he answers these questions to their satisfaction, then they will begin discussing the cost of the wedding and what sort of dowry they intend to provide. Finally, they arrange a third meeting where they will fix the date for the marriage ceremony. 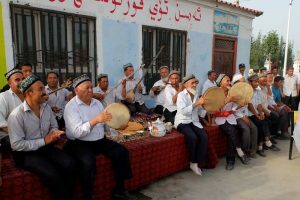 On the day of the wedding, the groom will travel to the bride’s house with a group of musicians. She will wait for him wearing a traditional red wedding dress, although nowadays some women opt for a white dress instead. The groom and his party must enter her home presenting gifts and singing lively songs. The ceremony itself is overseen by an akhoond, a type of Islamic cleric who is responsible for leading religious ceremonies. The akhoond will first ask if both the bride and groom wish to marry each other. After they have both agreed to the marriage, the akhoond will take a piece of naan bread, break it into two pieces, dip it in salt water, hand one piece to the bride, and hand the other to the groom. This act is meant to symbolise that the couple will spend the rest of their life together both in wealth, as represented by the bread, and in sorrow, as signified by the salt water. The bride is then carried to the groom’s house, where the couple will be blessed by the oldest female member of his family. This female relative is also the one who lifts the bride’s veil, allowing the groom to see and kiss his new wife, potentially for the first time! After the formal ceremony is over, the young guests will party, drink, and dance late into the night. Throughout the following week, both the groom’s and bride’s families will host large banquets for friends and relatives.